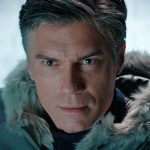 < Prev Post Federation Follies: Secret Agent, Man! Science Fiction or Science Fact: Save the Stardate! 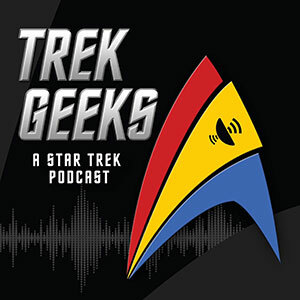 Have you ever wondered about the fancy stardate system on Star Trek? How does it work? 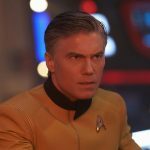 Nearly every episode starts off with a “Captain’s Log: Stardate 41554.7,” but why can’t they just say, “1100 hours on July 21st 2364” (which is the exact Earth-date consistent with the stardate given in the previous sentence, accurate to the hour). The reason for this and the answers to many other questions will be given in this special installment of Science Fiction or Science Fact; instead of critiquing technological themes and making an argument showing why they are possible or impossible, I will review the basic idea of a stardate and why it is necessary to keep a consistent record of time throughout the galaxy for the eventuality that Mankind will one day leave His solar system and explore other worlds and civilizations. As you are about to read, time is one of the most bizarre things in the universe, and what better way to demonstrate this point than by showing just how inconsistent the stardates were in The Original Series. One of the biggest errors, and greatest accomplishments, in science fiction history is the peculiar trend of stardates in Star Trek: The Original Series. This phenomenon is subtle and rarely noticed on the show, but much more confusing when you finally catch it. When watching the episodes of Star Trek: The Original Series, has anyone ever questioned the order of the episodes in relation to the order of the stardates given on each episode? The stardate given in the episode “Dagger of the Mind” (season 1, episode 9, production # 11) was 2715.1; in the following episode, “The Carbomite Maneuver” (season 1, episode 10, production # 3), the stardate was listed as 1512.2! Did the Enterprise go back in time, or did someone miscalculate the numbers when Gene Rodenberry wasn’t looking? This is a recurring phenomenon among the other episodes in the same series, and it is harder to explain on a scientific level. 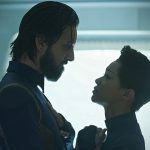 I did some investigative work (again, the science and science fiction nerd within me took control of whatever life I had…which wasn’t much) and I examined the dependence of stardate-progression on episode numbers and production codes. 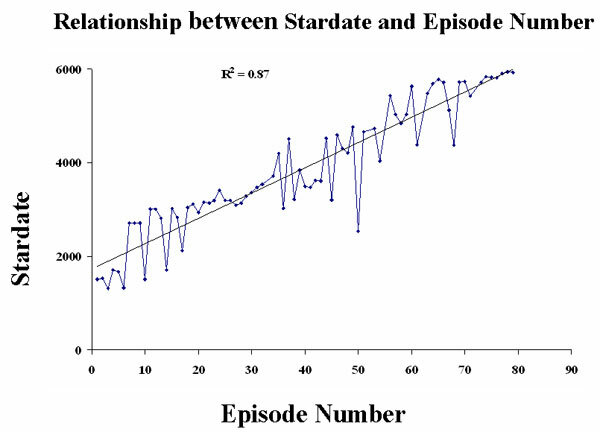 In the chart displaying the “Relationship between Stardate and Episode Number,” there are significant deviations from the linear trendline between each data point (note the up- and down-peaks after each value), which indicates an inconsistent trend in the progression of the stardate throughout the series. Basically, this shows that the order of the stardates does not precisely follow the order in which the episodes were aired. 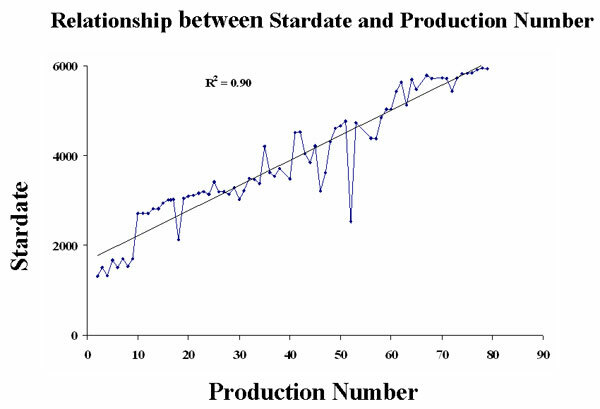 In the chart displaying the “Relationship between Stardate and Production Number,” the deviations are not as poignant. In fact, the data appear to be more consistent (despite a few valleys here and there; scientific data is never perfect). One observes a more linear trend of stardates after each episode when you take into account the order in which the episodes were filmed. Also note that the R-squared value, a calculation that determines the overall agreement between all the data points and their average best-fit line, is higher in the latter chart (0.90) than in the former (0.87). This doesn’t absolutely prove one relationship over another (proving things in science requires much, much more work than what is presented here), but generally speaking the stardate system showcased on The Original Series correlates more with the order in which the episodes were filmed than it does with the order in which they were aired. 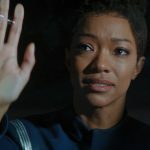 The results indicate that the writers assigned stardates to each episode as they wrote and filmed them, then CBS aired them out of order (which was apparently the case). Herein lies the confusion: the storyline seems to go forward and backward in time due to episodic disorder. 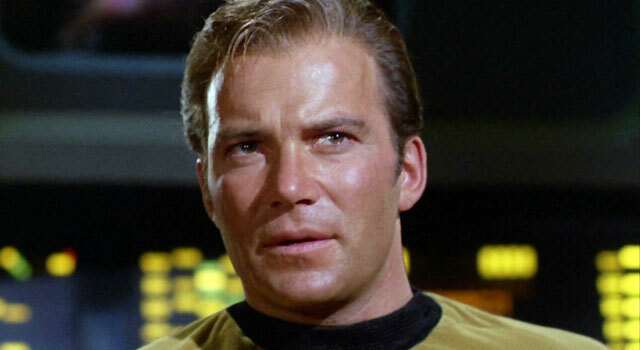 In an attempt to “rationalize” the jumble of inconsistent stardates, the creator of Star Trek devised a clever circumvention that lends itself the merits of scientific plausibility: one that turned a clerical mistake into one of Star Trek’s shining achievements! 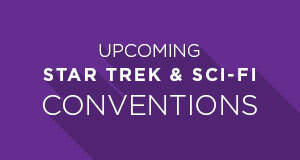 Gene Roddenberry has been quoted for explaining the stardate discrepancy as a timescale that accounts for “shifts” in “relative time” due to faster-than-light travel and different time rates throughout the galaxy (source: http://memory-alpha.org/wiki/Stardate). In other words, time progresses much more slowly in different places, and so the stardates would appear lower in those parts of the galaxy than in others where time is faster. Roddenberry’s explanation is plausible in the realm of science; the General and Special Theories of Relativity show us that our perception of time is relative to our vantage point in the universe. On a high-gravity planet, the progression of time appears slower (to an external observer, that is) than it would in a zero-gravity environment. You, yourself, probably wouldn’t know the difference because time is relative to the observer. Here’s a demonstration: imagine you’re “standing” on Jupiter (a high-gravity planet) and your friend is floating in space (negligible gravity, if any at all). Both of you have high-power telescopes with the ability to penetrate the thick ammonia, hydrogen clouds on Jupiter from any distance and zoom in really close to instantaneously view you and your friend at high resolution. To you, time is normal. Each second on your clock ticks at the same rate with which you are usually accustomed. To your friend, time passes by normally for him/her as well—one tick on his/her clock appears to be exactly one second apart. Now, peer through your fancy telescope and note the speed with which your friend’s clock is ticking in space. It is ticking faster than yours! Your friend does the same thing and finds that your clock is ticking slower! Is this magic? No, it is relativity! This is known as the Equivalence Principle of General Relativity. In layman’s terms, gravity causes time to slow down: one second on a planet is relatively slower than one second in space. It sounds like science fiction, but it is a real, observable phenomenon of physics. Not only did Albert Einstein show this to be the case in his famous thought experiments, but it was also confirmed using atomic clocks at different altitudes: one closer to Earth (higher gravity) and one farther from Earth (lower gravity), and scientists have shown that the lower clock “ticks” slower than the higher clock. This is the reason why GPS satellites have to be synchronized with clocks on the planet; otherwise even the slightest time lags in space can cause severe problems on Earth. The implications of gravitational time dilation are disturbing, to say the least, because it shows that one can travel out in space and endure a few years’ trip to distant stars and return home to find that thousands, if not millions, of years had already gone by on Earth. Time is asynchronous from different vantage points in the universe, and the cosmic clock requires a sophisticated system of timekeeping so that Romulans on Romulus and Klingons on Qo’nos can refer to the same, uniform time period. This is where the stardate comes in and that is why this one simple error of science fiction turned out to be one of the most magnificent testaments of Star Trek’s reservation toward real physics. And with that I leave you, the reader, with a little blast from the past (excuse the pun): an excerpt from one of Star Trek’s greatest demonstrations of relativistic time, an underrated remake of another underrated episode that pays homage to an underrated H.G. Wells’ science fiction story. 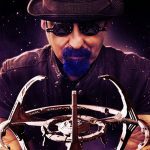 If you’re interested, you can go to the following website and calculate the actual Earth-date of any stardate given on The Next Generation, Deep Space Nine, and Voyager (this does not include the TOS stardates because those were “calibrated” differently). Tom is a recent graduate of UCLA with a Bachelor’s of Science degree in biochemistry. He is currently studying muscle growth mechanisms on his time off from school and aims to earn a Ph.D in molecular biology later in the future. He can speak French and Klingon, considers himself an avid Star Trek fan, and his hobbies include studying the Star Trek canon, playing video games, reading sci-fi novels, and performing cool science experiments on the side. ‘ej HISlaH tlhIngan Hol vIjatlhlaH!